The ABC series was the playground of the show's art and graphics crew, who slipped a number of subliminal and surreptitious credits into the productions, as well as a few inside jokes. Here's the complete listing. 1.1 So Who Are These Guys? 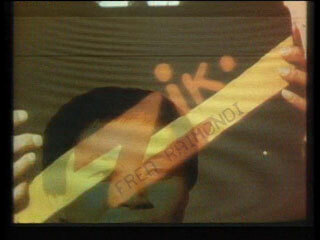 In the ABC pilot episode, the first cut of the opening credits ends with an ad from Network 23 sponsor Zik-Zak: a fast-cut montage of fragmentary images, mostly showing an Asian man's face with various Zik-Zak logos fading in and out, and a bizarre combination of elements such as a bowl of cereal and a spark plug. It is hard to tell how this montage was meant to fit into the story, as it lies between the more formal opening credits and the formal start of the show with the "20 Minutes into the Future" fade-in. It is, however, meant to represent the "blipvert" so crucial to the plot, and may have simply been inserted to show off the work of the editors. Observant viewers may have thought they... saw something extra in this blinding slide show. They were right. If the sequence is viewed at slow speed, or frame by frame, names in a simple computer font appear, laid across the other visual elements. They are the names of the graphics crew, who in this era of television did not rate standard credits, and so felt free to add their own. The added names are found in five of the first-season episodes, but the joke (or hack) must have been spoiled during the hiatus, as no second-season episodes contain such inserts. This list is authoritative and taken from the Shout! Factory DVD release, which was made from network broadcast masters. References to names appearing in other episodes may be due to fan/bootleg edits that put a clean set of opening credits from one episode on another; references to an absence of a name may be due to those frames being lost in a poor-quality or edited copy of an off-air recording. The names last about seven frames each, and are quite noticeable at normal speed... if you know to watch for them. The shocking truth behind these embeds is that "Fred Raimondi" was actually "Blank Fred," who was tried in Video Court for this subtle "zipping" and reduced to component molecules for his crime. His cohorts were sentenced to a "life and a day," and some are still in prison regretting their deeds. Such is justice 20 minutes into the future. Fred Raimondi is a very successful fx and title designer, still working in Hollywood. He is probably the primary architect of the dazzling Max Headroom opening credits, and used his position - and an entirely relevant sense of humor, and a bit of outrage at the lack of formal credits for his work in that era - to insert his name and those of some of the other digital creative artists in the high-speed edit. His web site covers his long and distinguished career, but omits this ancient prank. Perhaps he'd prefer to forget it. F-fat chance, Blank Fred. We remember. And grin. 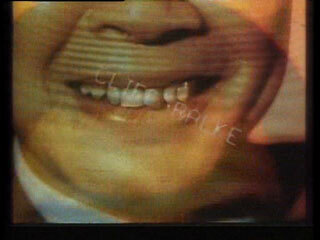 Cliff Ralke died in 1992. His IMDb page lists him only as a cinematographer and omits any entry for Max Headroom. It is likely that he did camera work on the fx or miniatures, which again was not credited in that transitional era. 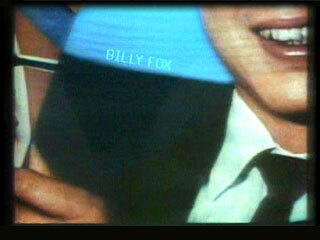 Billy Fox is a producer and editor still working in Hollywood. It is unclear what his role might have been although he has some early work as an editor, especially video editing - which again would have been an uncredited role in those days. Peter Sternlicht is a visual effects specialist also still working in Hollywood, mostly in visual compositing. 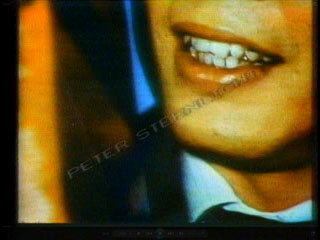 He likely helped assemble many of the video-screen special effects and fill material. Bill Stewart is... well, a Blank. 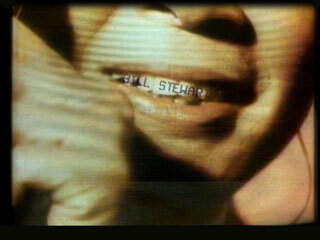 There are more than twenty 'Bill Stewarts' listed in IMDb and three or four likely candidates among those who were editors or cameramen. 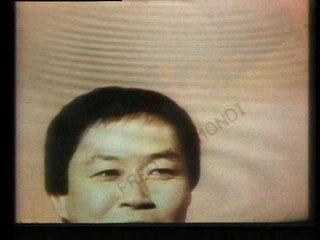 Since he, too, would be uncredited for any work on Max Headroom, there is no easy way to identify him among his clones. Next time you groan at an endless list of TV or film credits, though, remember these five skilled workers and the many thousands of others who have never gotten recognition for their work, simply because "the book" didn't include rules for crediting their leading-edge efforts. And remember that these five did find a way to credit themselves. I am indebted to the early Max web page by Bruce Marcot that brought these "embeds" to wide attention, including mine. Bruce's page is still up, still full of amusing bits and worth a look. "John Smith Television" in a network ID in episode ABC.1.6, as well as "J. Smith TV" in a rating list shown in episode ABC.2.1. The commonality of the name might be the joke... but if it's meant to be a reference to a person, there are approximately 35,000 people with that name in the US alone. Finding the right JS could be a chore. There are two unlikely "J. Smith" possibilities in the minor show cast: J.W. Smith, who played the rickshaw cabbie Rik in three episodes, and J. Arlen Smith, who played a nameless controller in at least one episode. "B. Stewart" as a co-author name in the title slide of Bryce Lynch's graduation project in episode ABC.1.6. Since Bill Stewart is one of the subliminal credits for this episode, a connection might be suspected. "J. Rivers" as another candidate in the telelection list, and the eventual winner, flummoxing both Networks 23 and 66. There is no matching name in the known crew list, so a reference to comedienne Joan must be the answer. Or not. Every episode of the series began in the same way, with a compressed form of the telefilm's dramatic beginning: the first thing viewers saw after the opening credits and first commercial break was a snowy screen with the sound of static, slowly fading into the opening scene. And, a moment later, the famous and brilliantly conceived "20 Minutes into the Future" slug. Every episode but two, that is. The US series began, in Episode ABC.1.1, "Blipverts," with a black slide reading PLACE NETWORK COMMERCIAL HERE before cutting to the usual fade-in. It might have been a broadcast error, an affiliate station failing to cue in the program, unless you noticed the blinking "Network 23" logo. As an opening shock-joke, it works as an effective way to alert the audience that what they're about to watch is... not the same ol'. To further shake up the proles, episode ABC.1.6, "Blanks," began with the slide shown at right, which then quickly faded into the usual opening static. 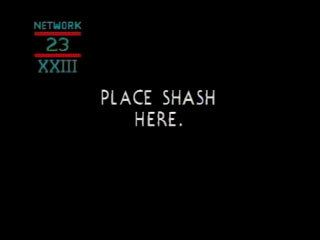 "NETWORK COMMERCIAL" is almost understandable, but... "SHASH"? What was this? At first, it looks like a compositing error - the "shash" slide being a placeholder for the fade-in static, with the substitution being forgotten before final output of the episode master. 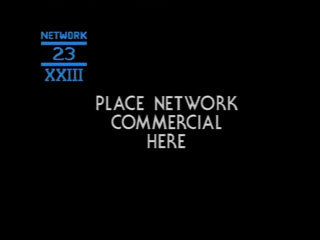 While it's possible for such errors to occur and even make it to air, that again doesn't explain the blinking Network 23 logo. The truth was ferreted out from one of the show's creators: it was deliberate jape at the network (ABC, not Network 23). "Shash" is old BBC technical slang for screen garbage caused by poor editing or mistakes - a holdover from the RAF radar days of many of the original BBC television technicians, used to refer to noise and interference on their screens. Not to put it too delicately, the word is a composite of "sh*t" and "trash." And, in the show source's explanation, that's a pretty good description of the inside of a network executive's skull. Max - the Max crew - had thumbed their noses right at the network brass again, and right in network prime-time. The miniature city used in the establishing shots throughout the series was built by a company called Image Engineering, and filmed by Xenon Productions. In many shots, especially in the second seasons, a building of moderate height, in between the Network 23 tower and the Art Deco-ish building that apparently holds Carter's apartment. has a bright green XENON logo nameplate. This page was last modified on 8 May 2015, at 09:21.